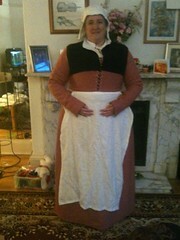 In august of 2011 we went to a tudor recreation at Kentwell Hall. 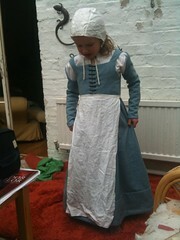 My elder daughter fell in love with the idea of being a tudor reenactor there. we visited again at Michaelmas, and she was definitely convinced. Since the death of my sister Vivien in 2010, i try a new [fun] thing each year with my girls in memory of her – ideally around her birthday of July 11th. Her last words were ‘have fun today’ which I think were pretty cool last words, even if they still make me cry, so I am trying to purposefully live up to them. In 2011 we went white water rafting, and the spray hid my tears. For 2012 this would be Kentwell. This blog documents my costume making for our family of 4. I have jigged the timeline of posts so that if you read the sidebar they are in a sensible order for anyone starting out. I am sure someone more technically savvy could fix it so they were always in reverse order on the side-bar, but it was beyond me! SO although there are dates, these are misleading. I started sewing in Sept 2011 for Kentwell 2012, and the added some items in Feb 2013 for Kentwell 2013 and Kentwell 2014 now I am currently starting sewing again for Kentwell 2015. I update the blog with posts going backwards in time! This is so you can read in chronological order what I have made. Throughout this blog are liberal disclaimers to following me slavishly [or even at all!] – and I hope I have written in good time where I would do things differently for anyone else completely new starting before their acceptance. My blog might be useful to those wanting some visual aids to use alongside patterns, books and scraps of paper. 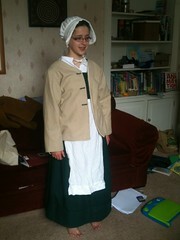 I don’t think anyone could just use my blog to create clothing for reenactment . This is after all just a record of what I have done, rather than an experts sewing book of patterns. It might help someone, and it might not. If you are Kentwelling, they have ‘elves’ = costume gurus to help you get it right once accepted, and costume notes and costume weekends were you can go and meet and they will help you make your clothes [I would particularly recommend this for trickier bits - kirtle bodices, gowns, male jerkins, doublets, hose - i went for hose and also used email to various costume elves liberally for advice and help]. I am not an elf [and v unlikely to be!] so as things change with new information and as the tudor years change the costume changes, always check with the costume notes! Other re-enactment groups may have preferred designs, colours etc also. 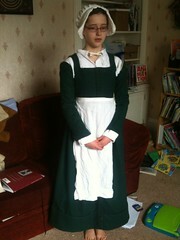 Part of re-enactment is about looking right for the period and fitting with your own group. 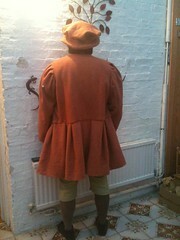 Sign off pictures: we are all signed off and approved for Kentwell 2013 – 1559 . I do need to complete the silk partlet for DD1 ‘rich’ outfit though. There are a couple of adjustments here, a new partlet, a black ‘guard’ arm extension, a different coif – tho she wore this one for the event, a let down of the tuck. In case you are wondering… no, I didn’t make this! 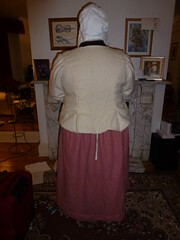 I made the shift, and am making a posh partlet, but Bess from my lady’s wardrobe has made all the rest and delighted DD1 by allowing her to wear it. There is no change from last year, she hasn’t grown enough to need any alterations. Sign off pictures: we are nearly all signed off and approved for Kentwell 2014 – 1578 . There is currently no change from last year. no new items and no adjustments. He is signed off in this. However, if I do make him a doublet, I will need to get check for the new clothes. There is no change with last years clothes, so have been approved on last year photos. There are a no real changes from last year, so last years photos used for approval. I have put a small triangular piece in the front to add a ‘kick pleat’ I will need to make her a new jacket next year I think. 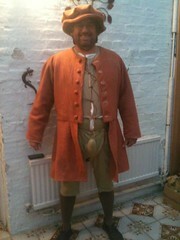 I have let down the growth panel in the kirtle, and have made a lightweight petticoate bodies for hot days. 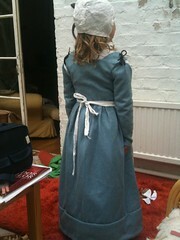 Hello, these period costumes look amazing, I am looking for a Tudor costume for my 8 year old daughter, please can you point me in the direction of where I can source this or if you create them yourself please do send me a price for purchase or hire, With thanks. thankyou, I have made them all by hand for re-enactment. my youngest daughter isn’t keen on the idea of me hiring them out though. If you are not having to be entirely authentic, they are relatively easy to recreate at home by using the posts in the sidebar for the kirtle for example, and running it up on a sewing machine. The red version is particulary easy, and for not-recreation but school trip use, i think you could come close to the look by putting a long red skirt onto a beige sleeveless/vest top and threading laces down each side, for example, with white shirt underneat and an apron on the top. I know that people that sell these for a living usually price them in the 100′s due to the amount of labour that goes into handsewing, and the 100% wool and linen. These are therefore the first clothes I have ever made! Still the cost of the wool is significant at approx 15 per meter, and linen at 8. Absolutely amazing outfits!!! 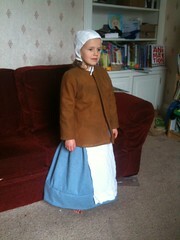 I’m looking to go to Kentwell in the coming year, so hopefully my kit will turn out half so lovely as yours!